After “drink more water”, what’s the most popular advice you get when you’re trying to fix any digestive issue? It’s common knowledge that eating more fiber will help increase your gut bacteria, and more bacteria will make you healthier, right? Recent evidence points to the contrary: more gut bacteria isn’t necessarily healthy, and in people with digestive issues, it’s extremely harmful. So if eating more fiber isn’t the solution to all your gut problems, what is? Today, Dr. Michael Ruscio joins me to answer this question and more. Dr. Ruscio is a leading functional medicine practitioner specializing in gut-related disorders, a clinical researcher whose work has been published in peer-reviewed medical journals, international lecturer, and best-selling author. 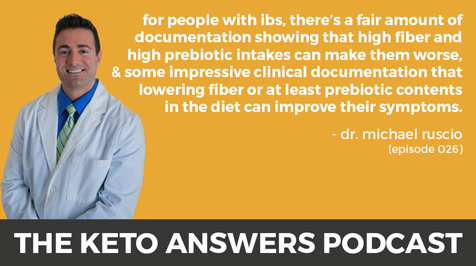 He has dedicated his entire career to studying the gut and all the complex relationships that affect it. His research led him to publish his best-selling book, Healthy Gut, Healthy You — in which he tears apart popular (and dangerous) gut health myths, reveals how your gut microbiota works and explains how to fix your gut health with an evidence-based approach. Your gut microbiota is a complex and still highly misunderstood network — and misinformation about what to eat only contributes to chronic gut issues. In our chat, Dr. Ruscio clarifies how your gut microbiota behaves, what it needs, and what you can do to keep it balanced and thriving.